For her latest Acoustic Tuesday, Jordan McCoy decided to cover Jason DeRulo's "Watcha Say." Check it out below. Check out the video below for a snippet of a new song from Dream called "Insane." It starts at the 1:19 mark. Two clips released on the Dream YouTube channel showcase new music from the group. The first clip, included below, features the group visiting a brothel called "The Bunny Ranch," acting as though they expected to purchase real rabbits from the establishment. Portions of the clip won't be suitable for all audiences (if that's you, skip to the second skip below). The second clip features the group visiting a dance studio and performing their routine to go along with one of the songs, title unknown. It's a catchy track, though. It has a nice vibe to it. In tribute to Michael Jackson, Jordan McCoy has posted an acoustic cover of the Jackson 5 classic "I'll Be There." Check it out below. 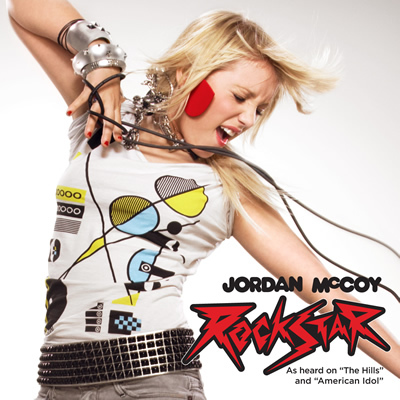 06/22: Jordan McCoy's "Rockstar" Featured on ABC Family's "Make It Or Break It"
On Jordan McCoy's Twitter, she mentioned that "Rockstar" was featured on ABC Family's "Make It or Break It." It's unclear if it was featured on tonight's season premiere or if it'll be on more than that. In honor of June 20's World Refugee Day, Jordan McCoy debuted a new, original song on her YouTube channel as part of her Acoustic Tuesdays. It's called "Sick and Tired." Jordan McCoy's latest acoustic cover is Taylor Swift's "You Belong With Me." Check it out below. For her latest acoustic cover, Jordan McCoy has selected Lady Gaga's latest single, "Paparazzi." Watch the clip below. In our audio player, check out the recently released full length version of Jordan McCoy's "Rockstar." It was released digitally on May 26 and can be purchased on Amazon.com, iTunes, Lala and elsewhere. In the clip below, Jordan McCoy performs "Rockstar" during rehearsals, joined by Danielle Keaton and Lindsay Taylor of Dream.